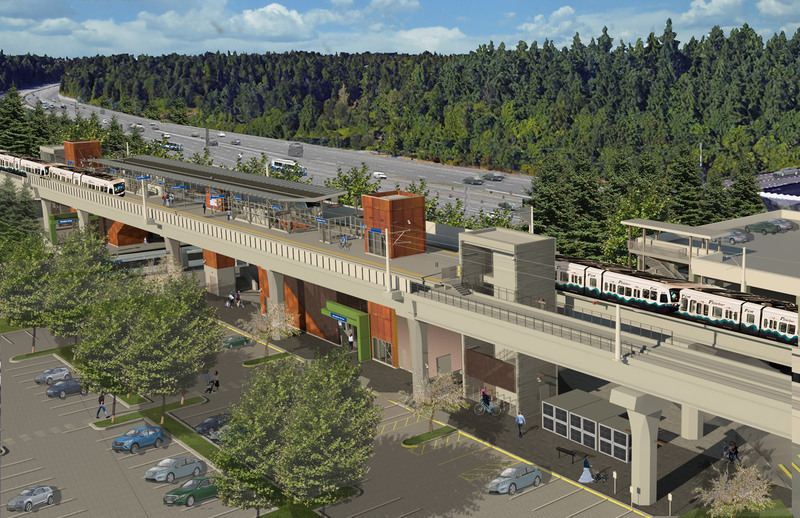 After a bit of inactivity, the flurry of Lynnwood Link news continues for yet another week. 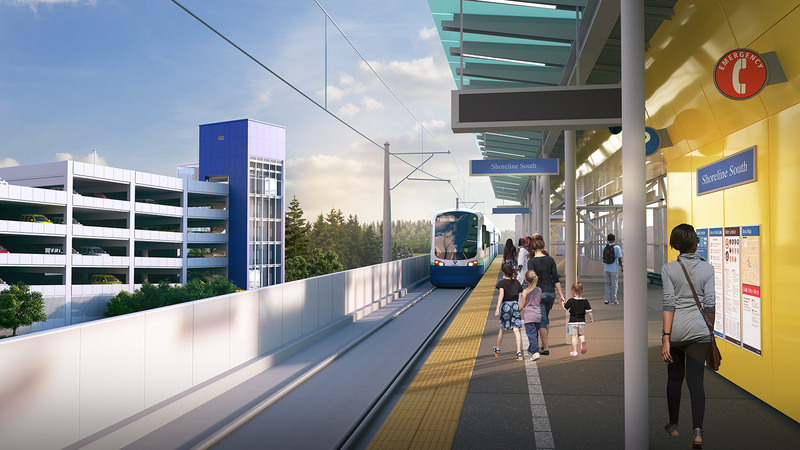 The baseline schedule for Lynnwood Link has been set, and the last round of design open houses we mentioned have been scheduled for later this month and late next month. Like all open houses, the online version has all the renderings and explanatory text that one could ever ask for. Lynnwood Link’s four stations have not quite reached 90 percent design, the final step before things can be locked in and ready for construction, but have progressed substantially. Thanks to the cost-savings measures adopted by Sound Transit, there’s been quite a few changes from 60 percent design, including slightly smaller garages in new spots and skinnier platforms that come one escalator short of a pair. Starting with the almost-but-not-quite NE 145th Street Station, there’s been a slight reduction in the amount of paved space, with more room for trees and plants. The garage’s elevators have been crammed inward and now take up less of the pedestrian areas. The station itself will have a shorter canopy, which won’t quite reach the elevators at each end of the platform. Like all Lynnwood Link stations, there will only be one escalator from the ground to platform level at each entrance, but there will also be stairs for the short climb down. Buses, including the currently unbranded SR 522 BRT line, will pick up passengers right outside the south entrance. The station’s commissioned piece of public art will be a pair of crop irrigation arms that hang off the south and north sides of the garage, arcing over the main pedestrian walkway and the passenger drop-off area. Artist Buster Simpson, also responsible for a sculpture in the Rainier Beach Station plaza and many works around the region, uses the sculpture to highlight the path of stormwater as it begins its journey through several drainage ditches and pipes and out towards the Puget Sound. Simpson is also working on a second piece of stormwater-related art for the station, which will be raveled at a later date. The Seattle/Shoreline segment of Lynnwood Link also has a few extra design details between the stations, as seen in the giant rollplots and supplementary sections on the open house website. The crossing of NE 130th Street will be elevated, and there’s a straightaway that is marked for the future infill station on the north side of the interchange, which would place the north entrance a half block from the fenced-off corner of Jackson Park Golf Course. 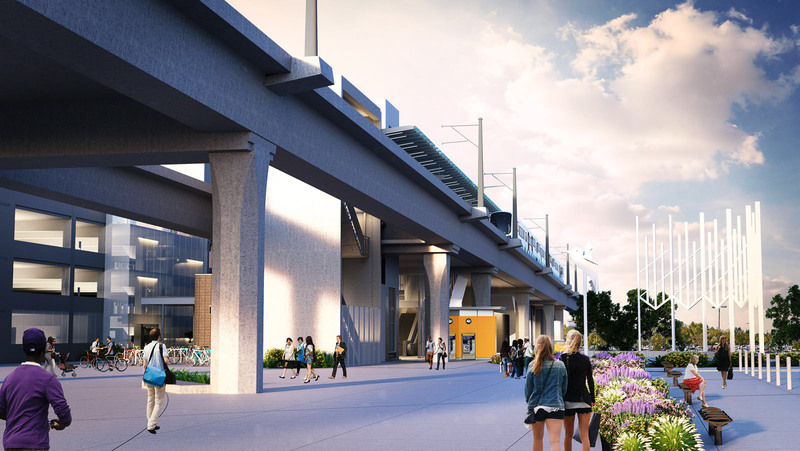 The Shoreline section will have a multi-use pedestrian/bicycle trail running under the light rail guideway, sandwiched between the new sound walls facing Interstate 5, new buffer plants, and new cul-de-sacs that Sound Transit is required to build for street stubs. As discussed last month, Shoreline North/185th Station has a new garage design that tucks two levels of cars under the bus bays and bus layover zone. Buses will have a dedicated traffic signal to reach 5th Avenue NE or NE 185th Street, while park-and-ride users will have to make two turns (one through a roundabout) to continue west towards central Shoreline. The renderings show the bus layovers as being a sea of concrete, which could really be depressing for bus riders to stare at while waiting for their next Swift or Metro bus to show up. The passenger drop-off area has been moved to the far side of the garage, which entails a longer walk around and across the bus and garage exits. The garage isn’t the only part of the station that has been dramatically altered, though. What was once a station with a single center platform is now a station with two side platforms, and not a single escalator in sight. Luckily, the impact for passengers who aren’t changing direction is minimal, thanks to the layout of the two entrances. The south entrance is level with the bus bays, while the north entrance is connected to the bus bay level by a short pedestrian bridge with stairs and elevators to both platforms. Tucked in between the garage and northbound platform, and continuing under the pedestrian bridge, is a public plaza with public restrooms, ticketing kiosks, and a few benches. Once again, the platform canopies have been scaled back, leaving part of the route for alighting passengers uncovered and open to the elements, so be sure to carry a hoodie or an umbrella. Phoenix-based artist Mary Lucking was commissioned to design the artwork for Shoreline North/185th Station, and chose to use forest imagery as her inspiration for several metal ornaments that will adorn the station’s plazas, entrances, and platforms. The platform’s columns will have metal vines growing up from the pavement, while metal shrubs will be sprinkled around other spaces. Mountlake Terrace Station remains largely unchanged from earlier designs, but the new metal-like finishes provided by artist Kipp Kobayashi brings the “natural” theme of the station together. 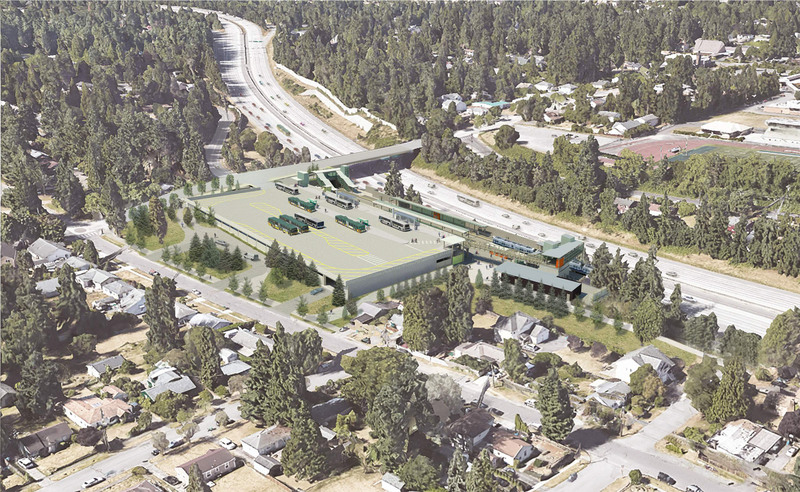 And keeping with the theme, Mountlake Terrace Station will require no new parking garage (reusing the existing one) and is already becoming a draw for transit-oriented housing. The station will hang over 236th Street SW, with an entrance on the south side of the street adjacent to a new bus stop, a large public plaza, and a new street for the Terrace Station development. The north entrance has its own plaza and a pair of bus stops that will require buses to loop through a street shared with garage users to a new layover lane on the east side of the current parking lot. Even further east will be a temporary parking lot for 220 vehicles during construction of the station (which will require the closure of the current surface parking lot) and will presumably be available for transit-oriented development as surplus property. Kobayashi’s contribution to the public art program will come in the form of a photographic mural on the underside of the light rail guideway as it crosses 236th Street SW, similar to the mural planned for Judkins Park Station. Unlike the rock-and-roll mural planned there, Mountlake Terrace will be graced with the image of two trees whose branches stretch out and over the street to connect. The image will be made using perforated metal, a material chosen as part of the cost-saving measures for the project, and be rendered in various colors. In contrast with the relatively compact nature of Mountlake Terrace Station, the terminus at Lynnwood City Center is a mess of parking lots, bus facilities, and trees. Since the last design open house, the garage has been reshaped from an “L” to a stylized “S”, or perhaps a pixelated version of New Jersey’s silhouette. The garage now takes up less space, leaving behind room for a wetland and daylit creek along 44th Avenue W, and has lost a direct exit to the HOV access ramp as well as a “high-speed” exit spiral. In response to a request from Community Transit, half of the south surface parking lot will now be reserved as a bus layover space, leaving space for a new east-west street between the bus bays and north surface parking lot. A pair of misshaped parcels on the northeast end of the station, facing the “gateway intersection” of 44th and 200th Street SW, have been turned into additional surface parking space instead of being marked for future development. The station’s two entrances are now tucked neatly under the shadow of the platform and guideway, instead of jutting out towards the bus bays and the Interurban Trail. Like the other three stations, the platform is now narrower and only has one escalator (which will presumably be stuck in the “up” position, angering many PM peak commuters). The narrowed platform seems to be a bit more cramped thanks to the perpendicular seating and shelters, possibly a reference to the cramped conditions inside the current (and future) Link cars. Claudia Fitch, a sculptor who created the two existing pieces of public art at Lynnwood Transit Center, returns with a sculpture celebrating the humble hummingbird as well as highway signage–the latter of which perfectly encapsulates modern Lynnwood. Her two sculptures will hang above the plazas adjacent to the two entrances and are meant to represent the natural history of Lynnwood before its devolution into auto-oriented sprawl, as well as the neon lights that once lined Highway 99 during its pre-interstate heyday. Mountlake Terrace – Wednesday, June 13, 6-8 p.m.
Shoreline/Seattle – Wednesday, June 27, 6-8 p.m.
Lynnwood – Wednesday, July 25, 6-8 p.m.
Noooooooo! That isn’t where the station should be. It should be above the interchange, so that people from both sides of 130th can get there. This completely ignores the whole point of the station, which is to enable quick and easy access to and from the buses. A bus should stop on 130th, then people should get out, and be able to walk up to the station without waiting to cross the street. With the current plan, someone from Bitter Lake would have to cross NE 130th to access the south end of the station. On their way home, someone from Lake City would have to do the same. That not only means a lot more people waiting for a traffic light (that happens to favor cross traffic) but also means more delays for that traffic (which includes the buses). Right now there are very few people who press that walk button, because there is little there. No one will use a north entrance to the station, because there is nothing there. Come on ST — get it right this time. You can see from the map that there are bus stops right there, on both sides of the street: https://goo.gl/maps/R8RDN6HiXHs. It is a short walk up to the platform from each bus stop. This is in the middle of a very urban area, where thousands access the station without using the bus. Yet it is still designed to make that transfer as easy as possible. The least ST can do is make the same accommodation for a station specifically designed for bus transfers. It truly is astounding how when ST is faced with two choices they invariably choose the one that is most inconvenient for people using the system. A station straddling 130th would clearly be advantageous. Is there no communication between ST and Metro? Maybe it’s just too hard for them to build something over an operating roadway. Seriously – I’d like to hear some explanation from ST on their rationale here. There are certain expensive and mind-blowingly stupid mistakes ST makes because they’ve been pressured into them. Bellevue tunnel, for example. This appears to be pure incompetence and/or penny pinching for no conceivable benefit. I would imagine that the comes from a desire by the Agency and the local jurisdiction to not have large construction impacts on the intersection. If you build the station over the roadway you would necessarily have more time with the intersection/roadway closed than if you’re just building the guideway. ST operates like a construction agency, not a transit agency. So it would make some sense they would have this bias. Still, it’s infuriating. I’m not even sure that is the case. If memory serves Seattle is going to do a bunch of work in the area anyway. They plan on getting rid of the little curve that allows a driver to easily take a right from northbound 5th to southbound Roosevelt Way (where this crosswalk is — https://goo.gl/maps/ohZwnATQid42). So it is likely they will mess with that area anyway. Besides, did they really talk to the head of SDOT? Since that head is temporary, did they consult with the mayor? I seriously doubt it. They did what they normally do — look at a map and say “we can put it there — close enough”. I’m also not convinced that it much harder to build the station over the intersection. At worse you would close off 5th (south of 130th) which is really no big deal. Folks can go around. The only real issue is if they close off 130th, and I don’t see why it would be necessary to do that. In other words, temporary impacts for drivers are more important than permanent impacts for bus transferers. Didn’t the cities want to increase non-driving mode share? Maybe we should make ST a Top Negative Ten Awards. amen to the RossB comment. It is also valid for stations on the West Seattle line at Delridge Way SW and 35th Avenue SW. It was violated at Mt. Baker and SeaTac; note the lack of a pedestrian connection between Link and southbound buses on International Boulevard South. a second comment about phasing. if the FTA funds and higher costs have delayed the line, should the NE 130th Street station not open with the delayed line? Well, in Mt Baker’s case the track is not crossing the street but turning into it. If you put the station over the street it would be parallel with it, not perpendicular to it. So the platforms wouldn’t span from one side of the street or the other. A center platform would require crossing the tracks to get to the exit, and side platforms might require crossing both tracks. ST has that at the surface stations but it would probably object to it at elevated stations because the trains are running faster so collisions would be more severe. Well, in Mt Baker’s case the station should be in the triangle. Obviously. The particulars are different (you have angles other than 90 degrees) but the dynamics are the same. Most of the ridership will come from bus transfers. Very Few people will actually walk up to the station and even fewer will walk from the particular direction we seem to be favoring. Even after we put the station next to a green belt, the folks who actually run the biggest transit system in the area (by people served, not by money raised) manages to put their transit center right smack dab where you should have put your train station (https://goo.gl/maps/X3vNXnWLVLG2). The only reasonable response by ST is “Oops”. Was it cheaper? Yeah, sure, probably. Is it better in the long run to ask thousands of riders to walk across the street (and thousands more to say “Nah, I’m good, I think I’ll just slog my way downtown”) instead of paying a little extra to do it right? Of course not. It was just one of the many stupid mistakes made by an agency that has made a lot of them, while spending billions on extremely dubious projects. Eddie is right. This agency has no history of doing it right. When they are short of money, or even when they have loads of it, they struggle. Unfortunately, it is up to ordinary citizens to explain the obvious when it comes to station location. I also think the process is flawed. Whenever someone points out a mistake made in the design of a station, someone mentions that it is up to the citizenry to do their part to help design it. During the open houses (when things are 10% or 30% done) we should organize, march, or do whatever it takes to get Sound Transit to do the sensible thing. Fair enough. But in this case, by the time there is an open house on the NE 130th Station it will be too late. It is bad enough that they are building the station years after they should, but they are making fundamental design decisions — such as the location of the station — without public input. There is no public outreach to communities like Lake City and Bitter Lake that will forever be hurt by putting the station north of NE 130th. Are folks from Lake City supposed to schlep all the way out to Shoreline (the nearest open house) to voice their displeasure? It is close to an hour bus ride just to get there. I suppose everything has to be done online, but it just seems like big decisions are being made without giving people a chance to point out how misguided they are. The most elegant solution for 130th, and in my mind, the only reasonable solution, is for the station to span the arterial carrying connecting bus service, such that you can board and exit the train on the end closest to the station exit that sits above your bus stop. This is how it is very typically done all over the world, as those who have been to such exotic locales as Vancouver BC will note. There is nothing there now at 130th standing in the way but patchy grass. It’s not like we are trying to wedge new station access into the built environment between high-rise basements and monorail footings. If ST is actively hostile to good bus-rail integration, they should flat out admit it and we should have a conversation about that. They seem to get it wrong too consistently to blame indifference. If, contrary to pretty much all evidence, they actually do care, then we should talk about what has gone wrong in the past and how we’re going to do things differently going forward. Maybe 130th needs its own post. Clearly it is going to need watchful oversight. Exactly. It isn’t rocket surgery. Put the station above 130th. Duh. Well, technically they’re only making an accomodation for the station, which doesn’t mean they have to put the station there later. They could rebuild the track over the street instead. What, you don’t think they’d do that? If it’s any consolation, when the decision is made in the 2020s or 2030s, there may be different people on the board with different views. Not just the track, if it’s elevated, it’s also the infrastructure that holds the track in the air. Look at Northgate and extend that 30 blocks. Since it is an infill station it will have to built on what and where the flat spot is that ST builds, which is part in parcel in the drawings right NOW. Is that elevated track going over Seattle 130th? I’m sure it is not. And it’s not as if ST has really built an infill station before – Graham St should be straightforward compared to this. And ST has shown that they do not want to build an infill station ever. No escalators at all at 185th? I think they must think that we are living in Logan’s Run where no one is over 30 and has trouble with stairs. There’s only one elevator and side platforms now too. It’s clear that riders are going to be treated like the second class citizens in this design. Yet we’ll be treated to art. Why is THIS how ST cuts corners? It sounds like imperial royalties in the past, where the public needs are not important yet we can look at the pretty features on cathedrals and castles. Yep, agreed on North Shoreline Station. Really don’t like side platforms, only because if one elevator is provided and if it breaks down, ADA riders have to backtrack eventually to use the station. Advantages of center platforms, is two elevators are provided, and if one breaks down, ADA passengers still have station access. See Mt. Baker, Tukwila and SeaTac (for access to Int’l Blvd) for what happens when an elevator breaks down. Shoreline North will have two elevators per platform (one at each entrance), and the northbound platform has step-free access via the sidewalks on the north side of the station. I might not ever use that station, but I agree. There should be an escalator going at least one direction. It is in my opinion that Sound Transit is getting paranoid about ST 2 timeline promises. And they should. The problem is that now they are building to minimum standards for that area. Narrow platforms, no escalators with side platforms. I have no solution but I think it isn’t good. Oh I totally agree. I think ST is very nervous about completing the ST2 projects in the next 5-6 years as promised (you can forget about the original cost estimations). Their list of excuses has already grown quite long and the people in the ST district are tired of all that and just want to see results and commitments kept. Mention was made in the article about the 130th infill having a straight segment for the future station. No mention was made on this for the 220th infill station. Was this a miss on the authors part, or is that second straight segment being removed? If you look at the roll plots for that area (https://lynnwoodlink.participate.online/Media/Default/rollplots/MountlakeTerrace_RollPlot.pdf) it does mention it. The station would be south of 220th, on the land that where something (a school administration buildings?) has already been demolished (https://goo.gl/maps/NG9afD6E3zP2). Headed north, the train would then turn to get close to the freeway again. The reduced canopies are unfortunate, but could presumably be changed in the future. At least the train frequency will be good so you won’t be waiting there long. However, station platform access is much more difficult to fix. One escalator at most stations and zero at one station? “But you can take the elevator.” Is Sound Transit really planning on such light ridership??? Especially at Lynnwood which will be the terminus for a *long* time. Is this really enough capacity for *all* the express bus passenger volume from points north as well as the park and ride and local riders assuming Lynnwood City Center ever gets done and/or Community Transit increases frequency on the local busses? Furthermore, if 405 “BRT” is really supposed to be that good, shouldn’t the 145th ST station be built to rail – rail transfer standards? Grrrrr!!! Riders will continue to be treated as second class citizens until we form a loud group to affect ST decision-making. I had wished Seattle Subway or the Transit Riders Union or even Transportation Choices Coalition would be a flag bearer — but their passions don’t seem to be interested in loudly taking on station access issues. For Lynnwood Link, I’m not sure what can be done at this point. However, we have a few dozen other stations getting built before 2040 that will need people to speak up in an organized way. My advice would be to start attending transit board meetings……….. and submitting public comment every chance you get. If I were still alive when the NE 130th St station opened, and still living on NE 135th St, I would be one person who would use “the north entrance a half block from the fenced-off corner of Jackson Park Golf Course.” There is a very nice trail through pretty woods from 15th Ave to 5th Ave, leading right to this proposed entrance. And who knows, maybe Jackson Park will be an actual park by then. Right, and your neighbors (who took the bus) will wonder why you weren’t on the previous train. Look, I’ve walked that trail before (many times) and there is nothing wrong with it. Just like there is nothing wrong with other trails. But from a transit perspective, it is not a great idea to put a station away from people, away from the primary users, and close to a park. Someone like you might walk 15 minutes to get on a train, while thousands and thousands more people will spend extra time waiting to cross the street. From a walk-up standpoint, the station is poor. You really can’t justify it based on the number of people who would walk to it. There are some apartments nearby but since a good section of the space is used up by the park and the freeway, you aren’t going to have a lot of people walking there. Even from that perspective the station should be farther south. Most of the apartments are south of Roosevelt Way, and from a development standpoint, there is way more potential there. You can’t expect the areas to the north to grow — what makes that place a pleasant place to walk (the park and the wetlands) mean that you will never have apartments there. But you can have a lot of people taking the bus there. The main reason — really the only reason — they are building a station there is to provide good bus service from Lake City and Bitter Lake. This, in turn, can lead to a much better overall transit grid. Forcing those riders to spend an extra minute or two to cross the street doesn’t sound like a big deal, but when you consider the numbers involved, it is much worse than forcing the handful of folks like you to walk just a little bit farther up the street to catch the train. If done right, you wouldn’t even have to cross 130th (there would be an entrance on either side). Sure, I guess. I was being half-facetious since clearly only a few people like to hike through the woods to their transit stop. When it became clear that the NE 130th station would not be built with Lynnwood Link, I resigned myself to never being able to use it in my lifetime. I’m also resigned to losing one of my one-seat rides to downtown, the 41, when Northgate Link is done, and losing the other one-seat ride, the 522, early in the ST3 process. At Mountlake terrace there will be the option of walking through a small wood to the city center. Yes! You can walk through those Mountlake Terrace woods now on the way to the park and ride and bus stop. The times I have walked through there I have always seen one or two other people heading to or from the park and ride. The path leads more or less directly to the Diamond Knot brewpub. That’s just nonsense. Up here in SnoCo I have seen plenty of wetlands impacted by apartment complex construction right next to them. Heck, the whole backside of the Lynnwood Costco was once a much admired local wetland that I thought would never be “mitigated” in my lifetime; I was wrong. >> I was being half-facetious since clearly only a few people like to hike through the woods to their transit stop. Oh, it’s not a crazy thing, really. The quality of the walk matters. I think most people would rather walk through a park, then walk along a busy arterial. That is why Ballard ridership will be stifled by the decision to only have one station where they put it. Folks who live in Old Ballard, or along 24th NW aren’t likely to walk to the station (they may take a bus, or just drive to their destination). The problem in this case is that not that many people live where you live. There are people, but you really have to get into the territory of big Vancouver/Toronto style towers to get lots of riders that way. In Vancouver it is common to have a nice park-like walk from a big tower to a SkyTrain stop. In this case, though, that isn’t going to happen. It isn’t like the north side of the street has a lot more people than the south side, or that either have that many people really. Lacking a really strong preference from a walk-up standpoint, and the importance from a bus transfer standpoint, the obvious solution is to put entrances on both sides of the street. Yeah, when the 41 works, it works really well. I don’t commute downtown anymore, but just the other day I took the 41 downtown and back. I caught the bus at about 3:00PM from the Westlake station and was at Northgate in less than ten minutes. Thinking about it, I really don’t think you could beat that with a taxi, let alone a car when you factor in the parking. But it isn’t always so great. In the evening it is terrible if you are headed downtown. Regardless, most one seat downtown rides are going away in that neck of the woods. The thing is, we get something out of it. A lot, really. Not only will we get better reliability, faster speeds in the evening and (hopefully) better frequency to more places, but we also get much better connections to other parts of town. That is what an effective subway gives you. It isn’t necessarily faster to downtown, but it is much faster to places like the UW and Capitol Hill. Do you really think the city will get rid of the parks and turn them over to developers? After all the work that has been done? Places like Thornton Creek (http://www.seattle.gov/parks/find/parks/thornton-creek-natural-area) and Licorice Fern are now owned by the city, and they (along with volunteers) have added trails, benches and other amenities, and you think the city would just sell it off? Even the golf course isn’t likely to be sold. The Jefferson Park idea isn’t likely to happen, but it stands a chance, given the special circumstances behind it. The neighborhood could get underground service to the junction in exchange for new apartments on part of the golf course (and the rest of the park turned into a regular park). But in this case, the community would get nothing. I just don’t see it happening, because I can’t think of any instance where the city sold off parkland just to build apartments. RossB you make an excellent argument that the NE 130th St station…should not be built at all. No walkshed, parks on two corners, other stations very close, etc. That was the position I took when the station was proposed. Then it was approved, so I advocated for building it when Lynnwood Link was built, not sometime afterward. Now it won’t be built for a long time, if at all, so I guess I have stopped caring. One thing I don’t think mentioned by other commenters is that the south side of 130th at 5th Ave also has an exit ramp from I-5. I don’t think there is much room at all for a piece of a station, even a mostly elevated one, not if you want to keep that exit ramp there. Evidently a similar calculation was made for the “145th St” station, which is actually going to be more like at 147th St, completely out of the way of the 145th/5th intersection and the freeway interchange. 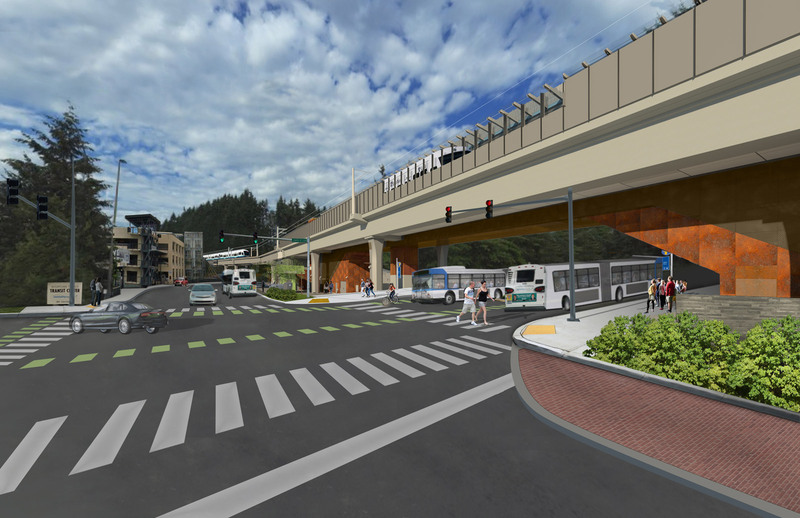 I don’t recall any serious consideration given to an elevated station over 145th St., even though more buses including a RapidRide bus will be accessing this station. Finally, in the realm of additional excuses for Lynnwood Link to be late, the steel tariffs the Trump administration has imposed on virtually all foreign steel is likely to drive costs up. According to The Economist, on June 5th hot-rolled steel cost $329 per ton more in America than in Western Europe. The gap for aluminum was $290. I doubt ST has figured this stupid tariff into their cost estimates yet. One escalator short of a pair means more than one set of officials, starting with the ones whose job is to forbid dangerous buildings from being built ought to be in jail already. And while I certainly oppose prison overcrowding, the elected officials what approved it are way down my list to Amnesty international. Week or two back, at University Street Station, found a woman in her sixites who could barely walk, halfway down the stairs from mezzanine to platform. Very large number of station stairs are granite blocks sharpened with a chisel. And the staircases of our outdoor elevated stations need an axe, a rope, and a set of pitons to reliably reach the floor or ground alive. Good thing all the elevators work. One quarter of the four elevators was boarded up and signed with excuses. If I hadn’t gotten down those stairs fast enough to help her, the next three ST-‘s would have gone into a wrongful death judgement. Too bad my self-control has now slipped to the point where defense attorneys won’t let me on the jury. So no choice but to yield my time for Alex Tsimerman to deliver my testimony for me. Too bad, though that the average fascist billionaire (who threw a very different salute than the the Nazis’) has more respect for his own statue to let something like this happen to a sainted elderly woman. However,any Italian train passenger in reading this: Did Mussolini ever really keep his promise about on-time performance? I guess almost a year late is better than never. I’m guessing that the scheduling issue lies with the convention center, who are probably booking steady business. The library is too small to host a large open house, so ST doesn’t have much choice. McDonalds Furniture Wharehouse, they could bring chairs and tables in from any number of party rental places…. Exactly. The Edmonds School District High Schools (Edmonds-Woodway, Lynnwood, and Meadowdale) are also most likely available for such a community outreach meeting. The truth of the matter is that Sound Transit canceled their outreach meeting for the Lynnwood area after announcing the cost escalation issues with the Lynnwood Link project last August. They just weren’t interested in facing the constituents up here in light of this news. I’m mostly concerned about scrolling with “Lynnwood City Center Station”, if that’s really the station name. I wish it would just say “LYNNWOOD”. There are other pairs with the same name, like “Bellevue Downtown” and “South Bellevue”, although they don’t start with the same word. I’m not sure there’s a prohibition against starting with the same word.